While they were talking on rounds, they decided that since it’s clear that Ava is not doing well, they are going to try to start her on another heart drug tomorrow – Dobutamine. It’s like Milrinone, and if it works, the dr said we might be able to buy Ava another 4-6 weeks waiting time for a heart. This news kinda broke my heart. Jason and I know Ava isn’t doing well, we know her little heart is just getting worse and everyday and I can see the effect of that… but hearing an actually time-line was hard. And it doesn’t mean the doctor knows for sure that’s all the time she has left, and we understand that. But I think they are just looking at Ava’s downward trend even in the past few weeks, and since it has been going downhill pretty rapidly, I think it’s fair for them to assume that at some point you have to reach the bottom. If God is going to send us a new heart, we need it to come fast. But in saying that, our doctor also told me today that if Ava does get a new heart now, it will likely be a slow recovery for her as her health has deteriorated so much. Even today she is still having blood in her diaper, but they have decided not to treat it, or even find out what the problem is, as the cure would probably be harder on her than the disease. So we are just asking for your prayers once again as we wait and trust for God’s perfect plan. So even though the news was hard to hear today – we know it’s still not the end of the story for Ava. 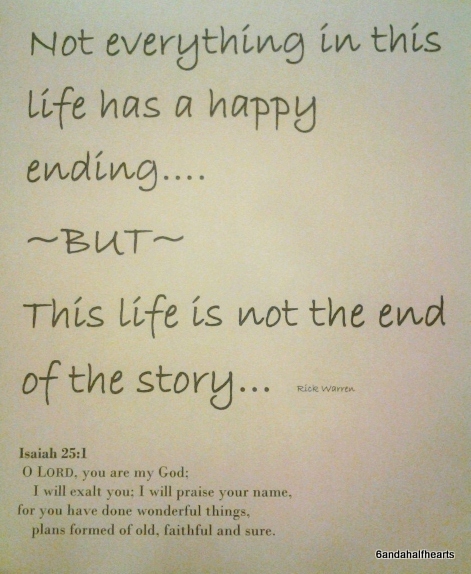 God still has a plan and He is faithful and sure. Once again, thank-you to everyone for your prayers and support right now. And we also wanted to shout out a huge thanks to Jason’s sister Lija’s co-workers at the London Courthouse… they had a fundraiser to help us out with staying at the Ronald MacDonald house and we were super blessed! !!!! Thanks guys!! We were really very honoured and the money will be a huge help, so thank-you. There have also been others who have contributed financially to our journey along the way and we are so grateful. It’s humbling to be at the receiving end but we accept it all graciously for Ava’s sake, it’s all for our sweet baby. And that sweet baby does seem to be a bit better. It’s crazy that they still don’t have any things conclusively wrong with her – in terms of infection that is. Clearly her biggest problem right now is her her terribly functioning heart, and so any infection, or even a cold or stress just escalates things to a point that almost tips Ava over the edge, as her Doctor’s so nicely put it. Wednesday morning things seemed very dire and the outlook for Ava did not look good at all. She had spiked a fever of 41 degrees and her heart-rate was over 200 beats per minute and there was no way her heart was going to be able to sustain that rate for very long. They had to start Ava on CPAP to take some of the pressure off of her heart (it’s a mask on her face that forces pressurized air into her lungs). Unfortunately, but not surprisingly she HATES it so she has had to be sedated since yesterday morning so as not to upset her too much. Yesterday they also put Ava on a cooling mat that seemed freezing to me, but thankfully she tolerated it and it brought her temp right down which helped bring down her heart-rate as well. They also increased her heart med – milrinone – to the highest dose to help her heart but that is only supposed to be a temporary measure and they plan on weaning that back to the middle dose that she was on earlier this week. She’s also on a low but constant infusion of morphine to help keep her calm and to keep any pain away. She’s kinda puffy still as she is retaining some fluid – always the fluid – and still really sleepy. But at this point things are looking like she will be staying this side of the cliff that she seems to live way to close to the edge of… and I’m glad because each of these episodes seem to age me 10 year at a time. In all of this we are so grateful to all the dr’s and nurses who have been so kind and caring. One of our nurses who is also a believer painted the verse for Ava from my last post on a little plaque that now sits in her crib, and one of the residents who had seen that verse came by and shared she was also a Christ follower and prayed for Ava today which was so encouraging. And both of our parents dropped everything to come down yesterday to be with us and that was so kind and the kids seem to be handling this OK as well. Sometimes you need extra strength from God just to get through the day, and yesterday and today were days like that. We got the results of Ava’s cath yesterday before she was even in the recovery room. The Dr who did the cath – who is also chief of cardiology here – came to find Jason and I where we were waiting in Ava’s room. When I saw that he also brought with him some back-up, in the form of the current staff cardiologist, I started wondering if the news might not be so good. He explained that Ava had tolerated the cath well but during the test they found that Ava’s tricuspid valve was very leaky and this was making the pressure in her lungs high, which is not what anyone wants to see. With high pressures in her lungs, Ava can’t get the next surgery she needs – the Glenn – which requires low pressure in the lungs so that de-oxygenated blood from her upper body can by-pass her heart and just flow passively into her lungs. We asked if they would consider going in and doing a valve repair and then doing the Glenn – but he replied that Ava’s heart should be compensating for this leaky valve, but it’s not, and so there is a concern is that Ava’s heart is just not as strong as they would like it to be. This news was a crushing blow… I never for once thought that Ava wouldn’t be able to get her Glenn. 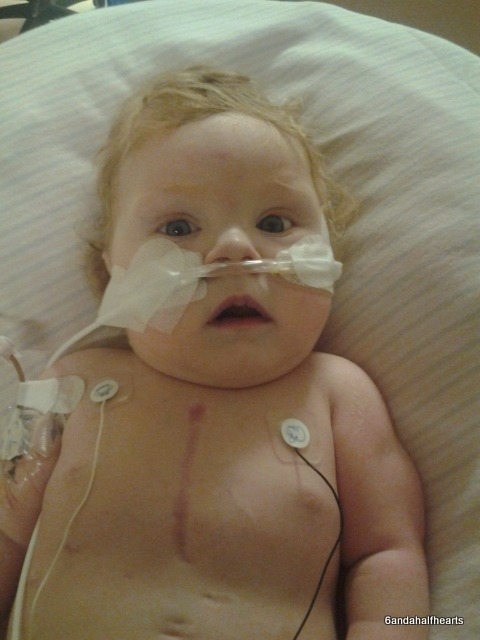 And even though Ava looks great, it’s hard to hear that her little half a heart is just not as strong as it needs to be. But we still don’t know what the future holds and this is definitely not the end of the road. As things stand right now, they have put Ava on a heart function medication – milrinone – at least for the weekend, which will help her heart function in case they do decide to do some kind of surgery next week, like a valve repair. Or they might decide to leave her on the medication for a few weeks and then repeat the cath. But we really won’t know anything until Tuesday, when the surgeon and our cardiologist and many other cardiologists will put their heads together and have a discussion about Ava and come up with a plan for her. So it’s very hard. Especially when Ava and I are here at Sick Kids and Jason has now gone back home to be with the kids. Until we get an apartment again at the Ronald MacDonald House we just can’t be together as a family, but we are praying that God will be gracious and move that process along quickly, because I have a feeling we are going to be here for a long long time. God will grant me strength for today and bright hope for tomorrow which is something I desperately need right now, and am so thankful that God is faithful all the time.